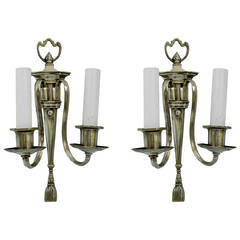 2-1670 a pair of polished brass oval etched mirror featuring a double arm ending with glass bobeches sconce. 2 x 3 inch switchbox required. 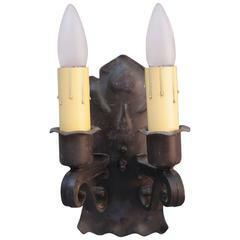 Pair of 1920's sconces with original hints of red and green polychrome finish. Measures 11" tall, 9" wide, and 3 1/2" projection. 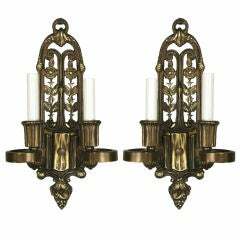 Classic pair of 1920s sconces with floral motif. Original finish. Priced and sold individually. Original polychrome finish. 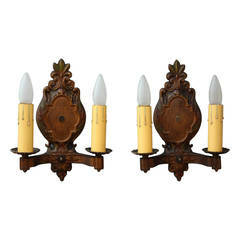 Would fit nicely in Spanish Revival, English Tudor or Gothic home. 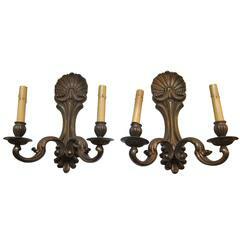 1920s pair of bronze two-arm sconces. Priced as a pair. 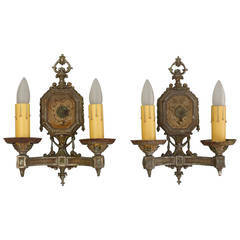 These can be viewed at our 5 East 16th Street location in Manhattan.